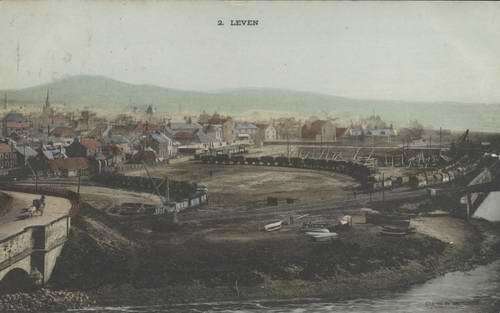 I acquired the following postcard of Leven Harbour. The first photo is a copy of the post card. The next couple are enlargements from different sections to help show greater detail. can be clearly seen in the background. 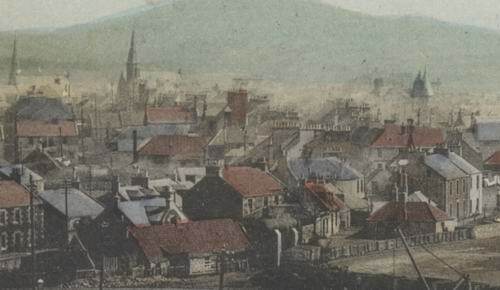 The photograph was originally taken in black and white and was hand coloured. 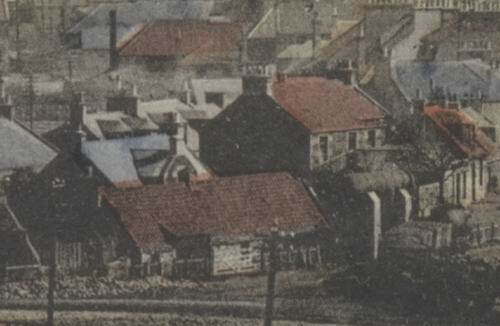 (the hand colouring can be seen clearly when the image is enlarged, it is quite blocky in places, see below). Boats in harbour are clearer on this first image as well as blocks of colour. The blocks of colour on the above houses can clearly be seen. Enlargement of buildings left hand side of pc. This enlargement shows part of the pc on the left. 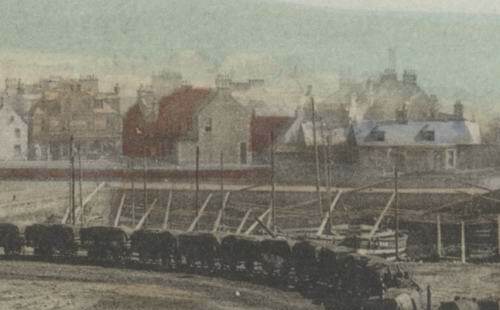 The Bawbee Brig can be seen on the left with two horses and traps crossing from the Leven side.. Wagons parked, not sure of the cargo as most have tarpaulins covering them. 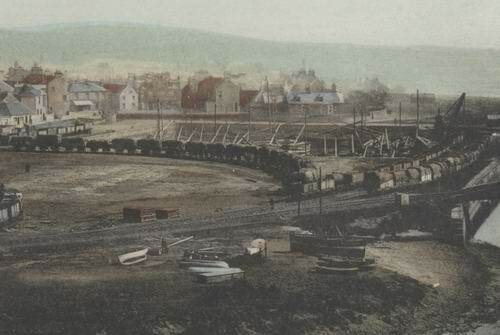 Although the wagons on the left side appear to maybe contain coal, some are empty. Its hard to tell the what the material is since the contents have been coloured grey!! hmmm. 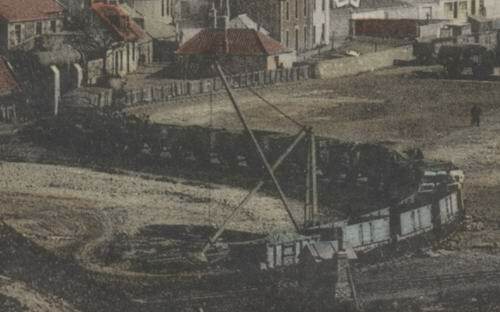 The rail line would appear to leave the site as can be seen middle left. Enlargement of area taken from the image above. The final enlargement of the pc shows the area on the right. Various wagons are seen with covers. 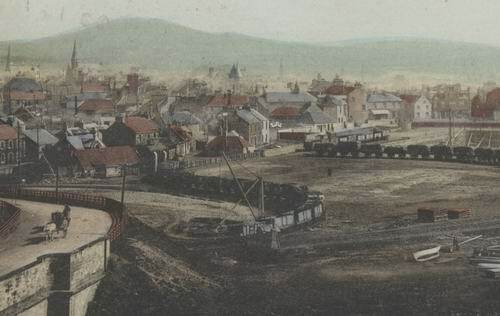 A number of boats (possibly fishing) can be seen in the harbour at Leven. 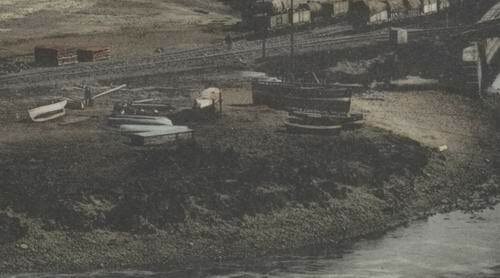 The rail line cross's the River Leven as the line appears to cross a bridge in the centre right of image.